Last night this was: four slices of fish past their eat-by date, a banana peel, three used teabags, two handfuls of soybean pods, an eggshell, and various don’t-look-too-close flotsam caught by the kitchen sink strainer. This morning: dry, crumbly compost, suitable for feeding to your plants or storing until next week when the day rolls around for Food Scrap Garbage collection. It’s not pretty, but it doesn’t SMELL. 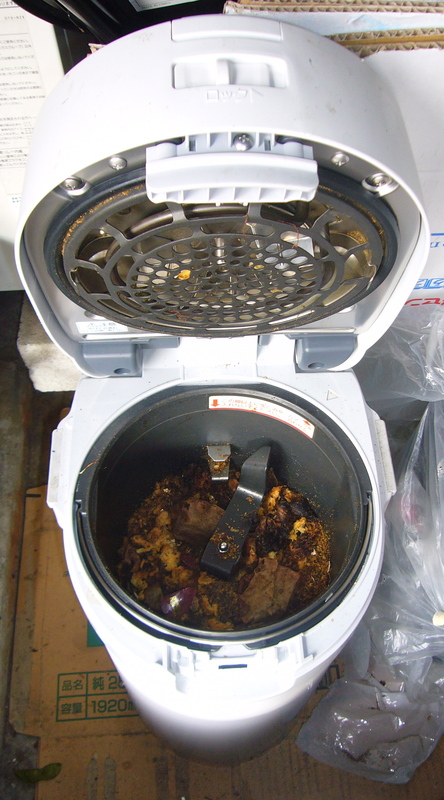 In a country where there are no in-sink garbage disposals, no yards where you can keep a heap of compost fermenting, and you have to keep all your trash in your apartment until it’s time to put it out for collection, the Garbage Dehydrator is a key appliance. You really only have to run it once or twice a week if you’re careful about not making a lot more food than you eat – I wait until it’s pretty full before turning it on. AMAZING! We need one of those so we don’t have to trot out to the composter every night. Yeah, I wonder why they don’t have these in the US. I bet a lot more people would compost if they didn’t have to deal with piles of food scraps sitting around, worms, etc.